Miyamoto Usagi is a ronin – a masterless samurai – wandering the world on a warrior’s path. Usagi’s story takes place in the early 17th century, known as the Edo Period of Feudal Japan. It is a tumultuous time in Japan’s history. The Tokugawa Shogunate has prevailed in the civil war and taken control over the empire, establishing a time of peace. Now the skills of the samurai, the aristocratic warrior class, are outmoded leaving them to fend for themselves. Many ronin lose their sense of honor and duty becoming hired thugs for new lords while others choose thievery. Some, though, continue the path of the warrior cultivating their spirits and skills, keeping the old ways, maintaining Japanese chivalry, and remaining bound to their oath to serve only one lord. This is the way of Miyamoto Usagi. Stan Sakai’s anthropomorphic samurai tale is an epic quest of a hero who remains good and chivalrous despite a world that has abandoned his kind. I started the series late (issue 102) and have fallen in love with the story. The 19 issues I have read have done nothing but pique my intrigue for what I suspect has been an incredible journey leading up to my entrance into the mythos. The Usagi I have seen is kind hearted and empathetic to the plight of others, inserting himself into the business of others in order to help or guide them. The reactions of others lead me toward the observation that this behavior is typical of USAGI YOJIMBO (transliterated as “rabbit bodyguard”). Sakai brilliantly immerses his stories in Japanese culture and mythology until they drip with authenticity and accuracy. The swords, the regalia, the monsters and demons, armor, attitudes, language, culture, religion, and architecture are all so meticulous one cannot help but feel deeply connected to the time period, the people, and their stories. Beyond the attention to detail, Sakai has studied the art of storytelling, taking his time to develop characters we can love and hate and question and care about. He does something that so many comic creators and publishers cannot seem to master or allow: He takes his time. While taking his time, Sakai also gives the reader the action that we expect in a samurai tale. There are swords and sword fights, one-on-one duels and monumental battles between armies. Even with the impalings and beheadings, the violence is cartoonesque and secondary to the overall storytelling. It is not macabre or shocking; in fact I would say the sword violence is unbelievably non-gory and the blood is often hidden or nonexistent. It is merely a detail of the time period. The fact that the characters are animals and the art is black and white also lends to the lessoned effect of the violence. 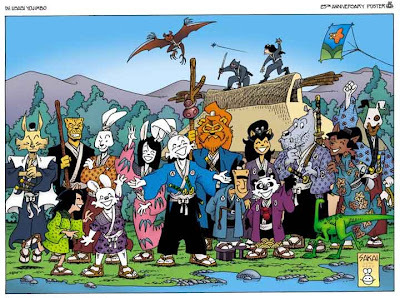 USAGI YOJIMBO is undoubtedly one of the greatest ongoing comics I have read. I lament the fact that I did not discover the rabbit bodyguard until 100 issues had gone by as I have missed out on an incredible journey. It is now time to go back and purchase some back issues or trade paperbacks. It is a samurai tale and there is cartoon violence. As discussed earlier, the violence is fitting the historical context and appropriate to the subject. The black and white art and the anthropomorphic characters make for a less violent and more appropriate title. The title does deal with Japanese culture, including mythological creatures and demons. The characters are mostly Buddhist. USAGI YOJIMBO is educational in its ability to weave an honorable warrior’s tale with overtones of empathy and kindness. Usagi is a quality military character whose traits children could learn to emulate. He represents several modern ideals from many camps of thought. The vastness of the storyline also gives students a chance to understand Japanese culture and history from a viewpoint not likely accessible or otherwise interesting to most students. The cast system, code of conduct, chivalry, and strong mythology give rise to so many aspects within the classroom, is hardly possible to write about it briefly. USAGI YOJIMBO is loosely based upon the famous samurai, Miyamoto Musashi. Sakai’s influences include the resplendent filmmaker, Akira Kurosawa; LONE WOLF AND CUB; and GROO THE WANDERER. USAGI YOJIMBO offers something entirely different to students. The historical and cultural benefits alone make the story worthwhile in the classroom. The character study and the forces of good and evil make for a story that will grab students and not let go. There’s no more violence in this than in any STAR WARS yarn.